Rahu and Ketu are shadow planets also called Chhaya Graha moving in opposite direction of the motion of the planets. Rahu and Ketu have no real substance but are the points where eclipses are experienced on Earth. Rahu and Ketu takes approximately 18 years to complete its journey around the Earth. In the year 2017, Rahu Ketu will transit into Cancer & Capricorn on August 18, 2017 and will stay there of 18 months. Rahu and Ketu are important points of inner transformation in the human person. Knowing where the Rahu - Ketu axis is transiting in your own chart can be very helpful. One should perform Rahu-Ketu Gochar Puja to increase the power of the benefic effects or to reduce the tribulations caused by malefic planets. The Vedic Mantras which are chanted are also very important part of the process. As every sound has an effect on our being; the ancient Rishis figured out which sound created what impact on brain and that is how the Mantras were created. The mantras chanted during the puja are the process of making the sankalpa manifest. Just as Sunlight is present everywhere, but when we keep it under a magnifying glass it creates fire. Sankalpa is like a magnifying glass. Here we will do Puja on your behalf which you can attend live on internet at our Puja link or see it later. On ordering the Puja, the date, time and venue of the puja will be informed to the clients via Email plus a link shall be provided through which you can see your puja live. With this you and your representatives are welcome to attend the same. 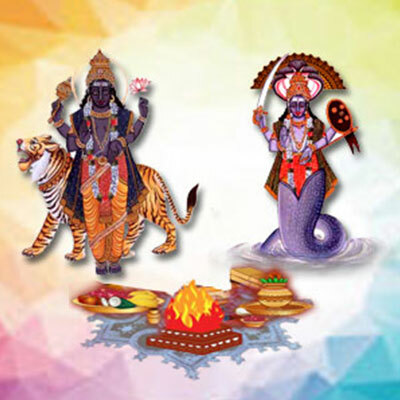 With this specific puja shall be held for each client. The Puja rituals are performed by learned priests in strict accordance with Vedic rituals. On the completion of the puja, prasad will be sent to you through courier.